The Lava Lands Visitor Center is located 11 miles south of Bend and provides visitors with interesting insights and information regarding the fascinating Newberry National Volcanic Monument. A variety of beautiful birds make their home in the area surrounding the visitor center. Open mid-April to about mid-October, the center is just 11 miles from Bend. 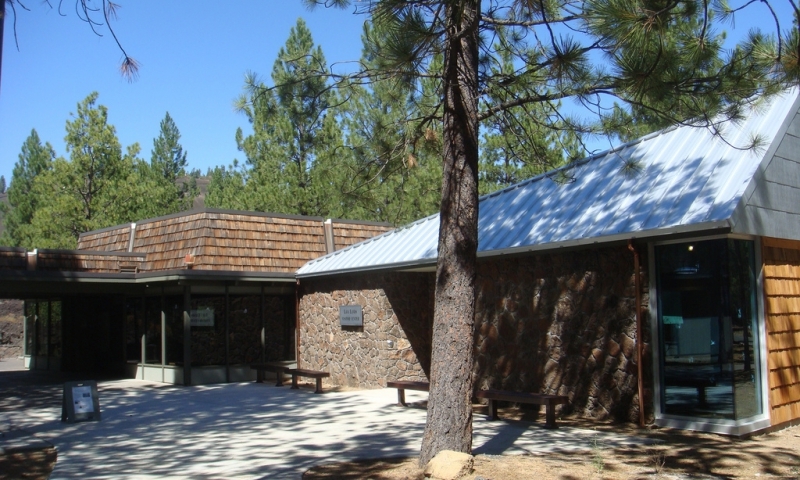 The center is located in the Newberry National Volcanic Monument and provides visitors with slide shows, exhibits, naturalists, and a bookshop. If you’re planning to visit the Newberry National Volcanic Monument just a few miles from Bend, a great place to start is the Lava Lands Visitor Center just off of Highway 97. During the day the center has naturalists who can answer any questions you may have. Located near picturesque Lava Butte and the fascinating ancient lava trees of the Lava Cast Forest, the visitor center offers interesting exhibits, slide shows, a bookshop, as well as all the information you’ll need to make the most of your Lava Lands excursion. The Lava Lands Visitor Center is just over 11 miles south of Bend off Highway 97. It is usually open 9 am to 5 pm from early April through the middle of October. Contact information: 58201 S US-97, Bend, OR. Phone: 541-593-2421. Visit the website here. Lawrence A. Chitwood Exhibit Hall – Be sure to spend some time viewing the interesting displays in this hall dedicated to the former Deschutes National Forest geologist who passed away in 2008. Interpretive trails – There are three interpretive trails near the center that are self-guided – the Trail of the Whispering Pines, the Trail of Molten Land, and the Lava Butte trail that circles the crater’s rim. Birdwatching – Bring your binoculars for close up views of beautiful birds including tiny rock wrens, Pygmy Nuthatch, Red Crossbill, Mountain Chickadee, and Green-tailed Towhees. The visitor center was recently renovated, adding about 1,500 square feet. land were covered with lava from that eruption. An overlook of the incredible Class VI whitewater rapids of Benham Falls can be reached via a ¾ mile trail near the center.